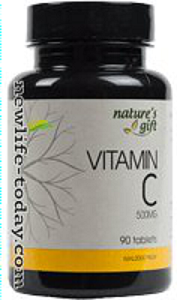 Buy this Vitamin C Complex at RM 151.05 (20% off retail) when you become a member of NewLife International. NATURE’S GIFT guarantees all vitamin and mineral potencies meet or exceed US federal regulations. NATURE’S GIFT guarantees that its products are manufactured with more than 100% of label potency, resulting in the finest products available in the health food industry. NATURE’S GIFT products are manufactured under special techniques to ensure high bioavailability. Purity, quality and manufacturing techniques vary considerably from one company to another. NATURE’S GIFT products are derived from the finest natural ingredients available. They are manufactured under the highest standards possible, using modern techniques of quality control. Certain minerals and particularly water-soluble vitamins such as C vitamins pass through the body quickly. In order to optimize utilization of up to 40% greater absorption and utilization, our range of NATURE’S GIFT Vitamin C and B Complex comes complete with a sustained release formula which provide for the slow release of ingredients over a prolonged period of time. When the tablet is ingested, normal moisture in the digestive system quickly dissolves the microscopic protein coating. The natural vegetable micro-get in the tablet begins to absorb moisture, releasing the first 30% of the ingredients within the first 30-60 minutes. As the tablet continues to absorb moisture.it slowly swells, gradually releasing the nutrients at a slow and effectively pace over the next 7-9 hours. As the tablet move through the digestive tract, there is continual supply of the nutrients to all absorption sites, offering the highest possible sustained bioavailability. 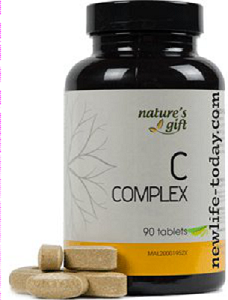 The NATURE’S GIFT C Complex gave my father a speedy recovery from his post surgical experience. It provided him a strong resistance against infections and surprised even his doctors as his age of 73 normally demanded a longer recovery rate. Mr. Tan, Johor. Whenever I sense my resistance lowering, all it takes is just 1-2 tablets of NATURE’S GIFT C Complex, and that’s it -I am sick-free! It’s an excellent product I won’t leave home without it. Ms. Chan, KL. Use as a dietary supplement, one tablet daily. Vitamin C or L-ascorbic acid is an essential nutrient for humans, in which it functions as a vitamin. Ascorbate (an ion of ascorbic acid) is required for a range of essential metabolic reactions in all animals and plants. It is made internally by almost all organisms; notable mammalian exceptions are most or all of the order chiroptera (bats), and the entire suborder Anthropoidea (Haplorrhini) (tarsiers, monkeys and apes). It is also needed by guinea pigs and some species of birds and fish. Deficiency in this vitamin causes the disease scurvy in humans. It is also widely used as a food additive. Vitamin C is an essential nutrient for us all as it acts as an anti-oxidant, protecting against reactions that can lead to some very severe symptoms, including the very miserable complaint of scurvy. It has been widely accepted for almost 30 years that the intake of large amounts of drinking water improves complexion and adds years to life expectancy, therefore if it is supplemented with ‘The Solution’ and all its many qualities, then it stands to reason that they will increased still further, by as much as 20% is an educated calculation. Vitamin C is water-soluble, and probably the most famous of all the vitamins. Even before its discovery in 1932, physicians recognized that there must be a compound in citrus fruits preventing scurvy, a disease that killed as many as 2 million sailors between 1500 and 1800. Later researchers discovered that man, other primates and the guinea pig depend on external sources to cover their vitamin C requirements. Most other animals are able to synthesize vitamin C from glucose and galactose in their body. Bioflavonoids also in recent studies have been shown to help the blood clot, this alone can be helpful in treating phlebitis and other clotting disorders. Many bioflavonoids prevent the cellular damage caused by free radicals; these are unstable molecules that are formed when the body burns oxygen. Some bioflavonoids are used as food preservatives to prevent fats from oxidation. Some reports show bioflavonoids are useful in enhancing the antioxidant action of certain nutrients. Bioflavonoids together with vitamin C, maintain the health of the thin walls of the small blood vessels known as capillaries, preventing bruising and bleeding, including excessive menstrual loss. Vitamin P are used extensively in the treatment of athletic injuries because they relieve pain, bumps, and bruises. Bioflavonoids can also be recognized for their antioxidant qualities. They perform a huge role in overcoming the negative impacts of free radicals that result in considerable cellular destruction. Free radicals hurt cells in a very similar approach as corrosion damages a vehicle. These types of dangerous atoms are prepared for doing damage to cells so the human body gets to be more vulnerable to different illnesses, coronary heart problems as well as other unfavorable problems such as early aging. The existence of bioflavonoids within the body deals with the free radicals and also gives protection to the entire body versus different conditions and premature aging. Rutin can be helpful in maintaining rigid blood vessels, and can help people who bleed or bruise easily from injury. Because it’s generally beneficial for circulatory problems, this flavonoid is often recommended for varicose veins and poor circulation. Rutin has also been used to treat glaucoma, hay fever, hemorrhoids, oral herpes, cirrhosis, cataracts, and glaucoma. It is helpful in reducing weakness in the blood vessels and the resultant hemorrhages. It can relieve the pain from bumps and bruises. Rutin also helps the body utilize vitamin C and maintain collagen. Collagen helps keep our skin healthy, elastic, and firm. Collagen breakdown has been attributed to wrinkles and lines. Hesperidin may have antioxidant and antimicrobial properties. It may have effects on the immune system and help prevent disease. The combination products that contain hesperidin and other ingredients may have beneficial effects on blood vessels. Hesperidin is a flavonoid found in citrus fruits such as lemons, oranges, and grapefruits before they ripen. Hesperidin is available as a supplement, both alone and in combination products with other ingredients. Hesperidin is a flavonoid mostly found in the pulps and rinds of citrus fruits. It has been shown to be useful in treating the complaints of menopause and in dealing with the viruses that cause herpes, the flu, and certain respiratory ailments. Acerola can be found growing wild and under cultivation on the sandy soils throughout north-eastern Brazil. It is native to northern South America, Central America, and Jamaica, Florida and Texas. The fruit of the Acerola Cherry tree, Malpighia punicifolia L. is rich in Vitamin C and carotenoids, with the cherry-like fruits being one of the richest known natural sources of vitamin C. The fresh fruit can contain up to 4000 mg Vitamin C per gram of fresh weight. Oranges provide 500 to 4,000 parts per million Vitamin C or ascorbic acid, while Acerola assays in the range of 16,000 to 172,000 parts per million. Acerola fights against coronary disease by helping to balance and strengthen the heart. It also helps the body’s absorption of the extracts of alfalfa and soybeans, both to promote heart health, which themselves. Acerola reduced the stiffness that often occurs in the arteries and discourage the clumping together of the plate. Acerola works as a stimulant of the liver, help the body regain its normal operating capacity. The liver is responsible for detoxifying the body, ridding it of impurities by filtering the blood. Acerola helps prevent liver disease by scavenging free radicals that are responsible for poor liver function. Rose hips develop on wild roses as the flowers drop off. The rose hip, also called the rose haw, is actually the fruit of the rose. They are one of the most concentrated sources of vitamin C available, which has led to rose hips being included in many common cold preventives and remedies. While the efficacy of vitamin C in preventing the common cold has been questioned, there’s no doubt about the beneficial effects of vitamin C. In addition to C, rose hips also contain A, D, Iron and E, as well as antioxidant flavonoids that may reduce the effects of aging and help prevent cancer. All this is wrapped up in the tart-sweet taste of the miniature fruits. Rose Hips, with its abundance of vitamin C, are useful in treating infections of all kinds and have been used for centuries for the relief of diarrhea and dysentery. It is considered to be a cleansing agent and may be helpful for temporary bladder problems, gallbladder dysfunction, kidney health, general debility and exhaustion. Rose hips assist the body in absorbing vitamin C after the breakdown of food in the digestive system. Vitamin C is essential in preventing diseases such as scurvy, which is associated with bleeding gums. Rose hips are used in the treatment of stress-related complications including stomach ulcers, high blood pressure and other circulatory complications related to stress. They are also used to treat complications related to the uterus. Ever wondered which Vitamin C to buy? 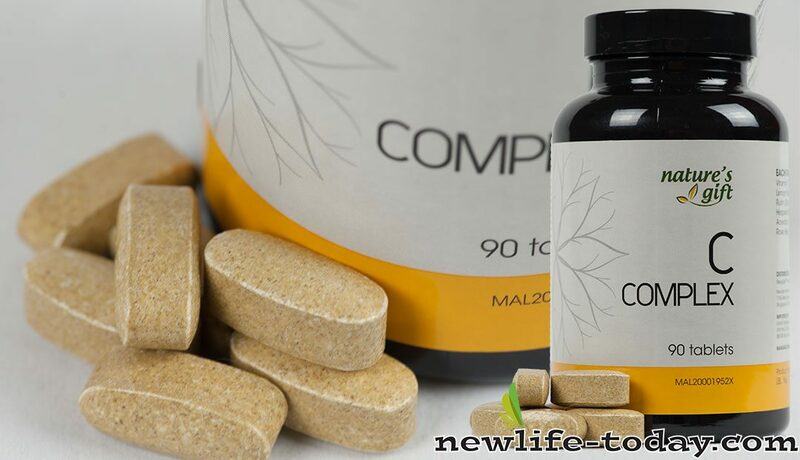 Summary : Vitamin C Complex has a bigger tablet form, suitable for adults, with more ingredients.